An arrow saves the day. From blazing fires comes the glow. The beasts to meet the blow. Richard tries hard to figure out a way to cross the chasm that cuts through the tunnel, knowing full well that Zock is right behind them. He looks across the chasm and notices that the flame torches lining the wall continue on the other side of the gap. He then notices the torches' metal clamps and has an idea. 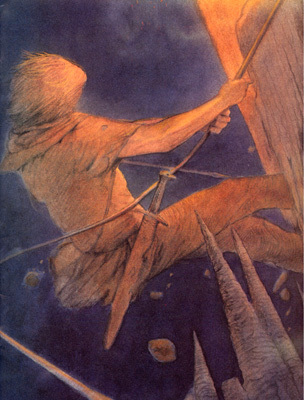 He tells Orkan to tie Melek's rope to an arrow and fire it over one of the clamps; they can then cross the chasm via the rope. Orkan calculates the odds and ties one end of Melek's rope to an arrow. He then aims carefully and fires the arrow, which manages to lodge itself in the bracket. Richard tugs the other end of the rope as a test - the rope holds firm. Orkan then begins making his way across the chasm along the rope while Richard and Melek hold the other end. Melek follows along the rope while Richard is left holding the end. With his friends safely on the other side, Richard now comes to the moment he had been dreading: swinging across the chasm on the rope. Just then, he hears a loud clamor behind him and turns to see Zock and his men almost upon him. Unable to turn back now, Richard places his torch in his pocket before stepping out into space. He swings through the black chasm before his feet lands against the rockface on the opposite side. He then quickly begins to climb the rope while Richard and Melek haul him up. As he scrambles up, a spear whizzes past his face and sinks into the rock, encouraging Richard to move even faster. Suddenly, Richard feels a lurch on the rope - the bracket holding the rope is loosening! Orkan urges Melek to pull harder and Richard to climb faster, which they do. Knives and clubs continue to be thrown as the scrambling Chosen One as he finally reaches the top of the chasm and crawls onto solid ground. With no time to catch their breath, they head down the tunnel away from Zock's horde. Soon, the torches along the wall peter out, relaced by a faint green glow coming from the very rock. After a while, the trio comes to a fork in the tunnel and decide to consult the Book of Prophecy. After reading the prophecy, Richard decides to use the Path Finder to decide where to head; the instrument ends up directing them down the right-hand tunnel. Down the tunnel, they begin to detect the smell of burning. When the tunnel opens up into an enormous cavern, they see a narrow path leading to a monstrous craggy wart in the cavern's center. They have found Enlil's dungeon, sitting in the middle of an active volcano. The group heads down the ziggzagged path towards the craggy wart until they find themselves standing in front of a massive pair of iron-studded doors, secured shut by a heavy sword supported by iron brackets. 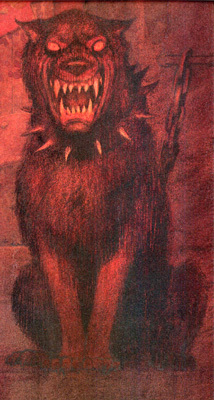 "On either side, tethered to the rock by a thick chain, stood a huge, savage-looking dog. The dogs' eyes stared blindly ahead, their pupils small black pinpoints at the center of bright golden embers. The beasts' heavy jaws were bared to display blade-sharp teeth, and beneath the dogs' spiked collars bulged barrel-chested bodies. 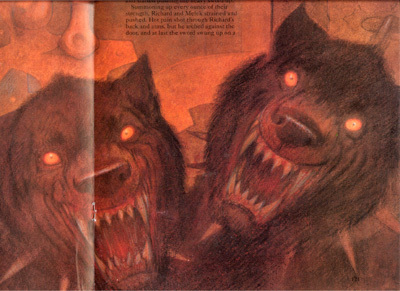 The animals were straining forward, snarling and pawing the air with their claws." Orkan tells his friends that he'll keep the dogs busy while they open the doors. 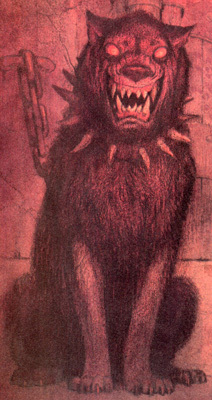 Orkan then draws his sword and approaches the hell hounds; the dogs rage forward, pulling their chains to the breaking point. While Orkan distracts the dogs, Richard and Melek duck under their taut chains and remove the heavy sword securing the iron doors, summoning every ounce of their strength to remove it from its braces. Once the sword is removed, they push the massive doors ajar. Richard then tells Melek to wait while he goes help Orkan. Richard darts under the chains and returns to Orkan's side, telling the pigman that he'll take things from here. Orkan nods and heads to the doors while Richard draws Juroot's dagger. Richard then pulls the tunic of Golan's cloak over his head, rendering him invisible. The dogs are stunned to see their prey disappear, leaving a weapon floating in mid-air. Richard takes this opportunity to make a dash for the tunnel, leaving the hounds to howl in realization and anger. Inside Enlil's dungeon, the trio make their way down a hallway filled with columns and carefully engineering beams, a scene resembling a cathedral. The tunnel grows smaller and smaller until it finally ends in an untidy pile of boulders. The companions creep over the boulders and see a gigantic cave on the other side. The center of the room contains a sulphurous, bubbling lake of molten rock. 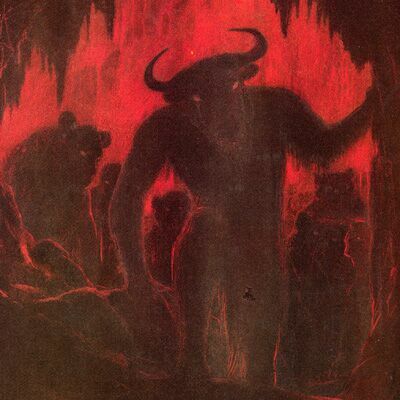 A narrow, jagged path creeps around the seething cauldron, and walking along that path are a chain of beasts carrying massive logs to feed the fires. They are obviously in pain, but their eyes suggest a hypnontic obedience. High above the cauldron on two stone pillars perch two enormous bats, watching their slaves intensely. Richard realizes they must be Enlil and Erna, and he almost squeals in delight when he notices a pod sitting on an intricate stand of tiny bones...right in front of the bats. Orkan asks how they're going to get the pod when it's sitting right in front of Enlil, when Richard senses Golan telling him to use the cloak. Richard tells his friends to distract the bats while he gets the pod. He then slips the hood over his head again, disappearing from view. Orkan and Melek step out from behind the boulders and near the raging lake of lave. Enlil and Erna notices the two intruders immediately and flap their wings in rage, preparing to attack. 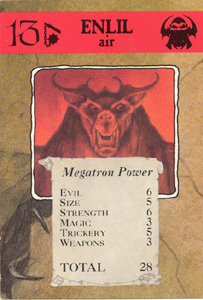 Orkan and Melek quickly grab stones littered about the floor and start throwing them at their adversaries. One of Orkan's stones misses the bats but hits the stem of a thin, chalk-white column. The column snaps and manages to loosen a field of stalactites hanging directly above Enlil and Erna, sending down a rain of stone spears. One of the stalactites catches the chain of an amulet featuring the mask of the Evil One around Enlil's neck, sending the charm into the bubbling lava below. The remaining stalactites pierce the evil bats' wings and bodies, sending Enlil and Erna tumbling screaming into the cauldron. 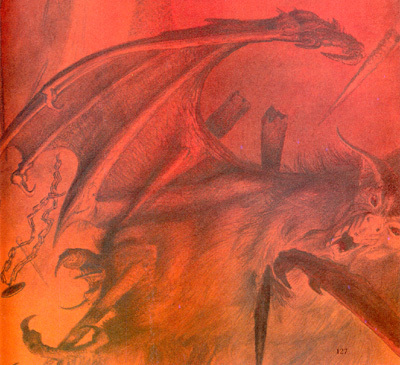 Enlil is an enormous bat-like creature who dwells within a live volcano inside an intricately designed dungeon. Because the volcano is dying, he keeps a team of slaves to feed massive logs to the volcanic flames in order to keep the fires going. Enlil is cruel and vicious, and he watches over his slaves night and day. By his side is his wife Erna, who is just as wicked as her husband and incredibly greedy. Around Enlil's neck is an amulet in which the mask of the Evil One is inscribed, though the amulet's purpose is yet unknown. Enlil also keeps watch over one of the Life Force Pods and never lets it leave his sight. 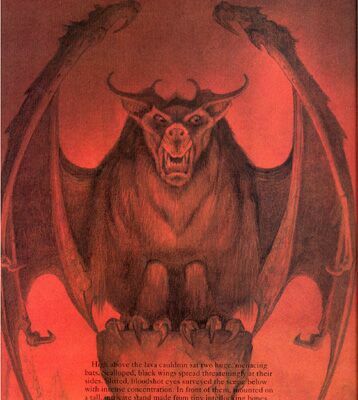 "High above the lava cauldron sat two huge, menacing bats. Scalloped, black wings spread threateningly at their sides. Slitted, bloodshot eyes surveyed the scene below with intense concentration. In front of them, mounted on a tall, intricate stand made from tiny interlocking bones, rested a small purpose object." In the eighth issue of The Ancestral Trail, another major story moment is realized when Richard secures the second of the Life Force Pods. As with the first pod, the ninth volume will reveal through clues in the text which pod Richard has obtained. He has already found the Pod of Endurance, what will this pod be? As noted previously, Melek's rope came in handy in the eighth volume despite a little plot hole in the seventh volume. When Orkan threw Zock's soldier into the lake, nowhere did it mention that Melek's rope was removed before he did so. Of course, one could easily assume that this was more implied than anything else, and that it's nothing to really worry about. The rope will come in handy again later in the story, but nowhere does the issue mention that Melek secured his precious rope after he and his friends used it to cross the chasm. It's interesting to see that the battle between Enlil and Erna was hardly a battle at all. In fact, it was arguably downright anticlimactic. 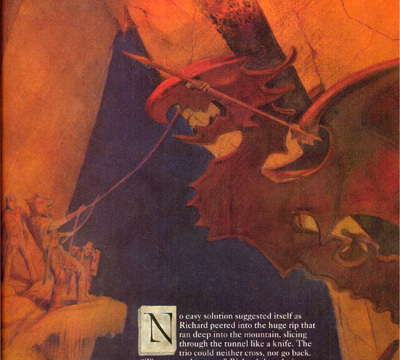 The bats were not killed by sword or cunning but by accident, and their battle hardly lasted that long, either. However, it does demonstrate that not all evil creatures are invincible and that they all don't have to be super-invincible and very tough to kill. Enlil and Erna were wicked, but that was probably all they were. But what was that mysterious amulet around Enlil's neck...? 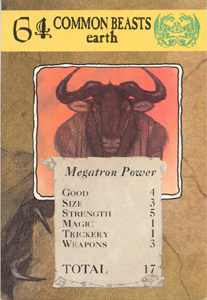 Finally, the people who printed out the Ancestral Trail playing cards made a mistake for Enlil's card. Instead of Enlil, the card shows a picture of his wife Erna. "If you tie Melek's rope to an arrow, and fire it over that metal clamp, you can get across while we hold the rope, Melek can follow and I'll swing across." "Hang on tight, and don't look down." "I'll keep them busy while you open the doors, but you'll have to be quick." "How on earth are we going to get close enough to get the pod? It's right in front of them."